Why Discard It? Use it in your Garden! Your old canary, Petey, is long gone. What to do with his birdcage? Simply remove the top, line it with sheet moss from the garden store, and plant trailing plants, like fuchsias, or plants that sprawl, like petunias, lobelia, or calibrachoa. Replace the top and set it outside in your window planter or on the deck. After a major bathroom remodel, what to do with your old clawfoot bathtub? Have the guys haul it to the garden, fill it with dirt, and plant a variety of plants inside and around it. What about that old metal colander? Spray paint it, affix lightweight chains from the hardware store to three sides, and add a swivel connecter at the top to hold the chains together. 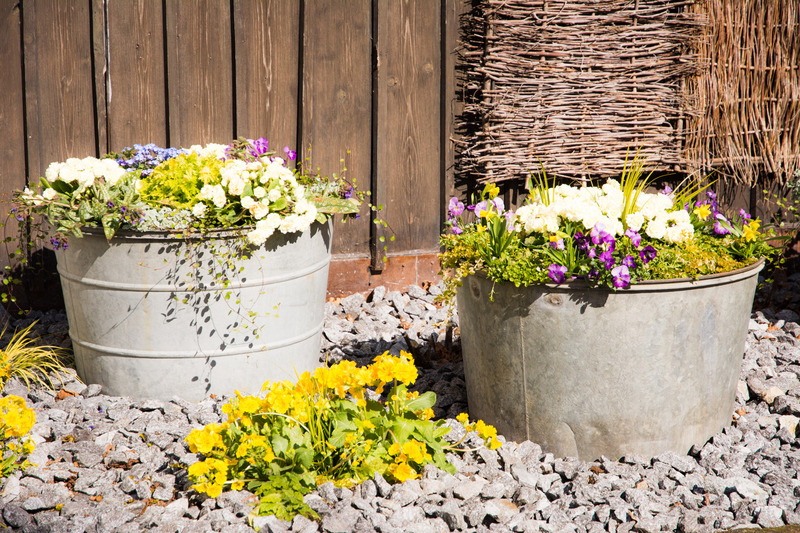 Line it with moss purchased at your garden supply store, add dirt, plant petunias, and voila! You have a lovely hanging planter. An old tea kettle with a few holes drilled in the bottom, makes a lovely container for herbs. Take that old watering can you found in the garage and fill it with thyme or oregano. Get creative with your unusable items. You might give them a second chance with lovely appeal, placed throughout your yard. Thatching – the overlooked spring chore. A superior landscape and lawn care company, Levy’s Lawns & Landscaping, LLC provides year-round services, including patios and rock gardens, sod installation, sprinklers, excavation and more. Levy’s Lawns & Landscaping, LLC design will keep your yard healthy with plenty of curb appeal. You’ll be able to turn over all the weekly lawn care chores to us and feel good about it. Let us design your next patio, rock garden, or water feature and make your yard a landscape wonder. Not only will you wind up with a landscape design your neighbors envy but you’ll get a little time back to go do other things. Call us today to discuss your lawn and landscape needs. Winterizing your Pacific Northwest yard. Our Top 7 list to prepare your yard and garden for spring. 10 Great Ground-covers for the Pacific Northwest. This is a family owned business. The owner has over 30 years’ experience installing landscapes for businesses and homeowners all over Seattle and the Kitsap & Mason county areas. He has participated in all manner of landscape techniques including wetland work and has the expertise to take care of your project. Our Maintenance manager has over thirty years of yard maintenance experience and gets rave reviews from our weekly customers for the work she performs. Together we have been taking care of yard installs and maintenance for folks all over the Puget Sound area. It's just what we do and we love it. There is nothing quite like working outside and helping beautify the community. Give us a try. You won’t be disappointed!